Advent is a season of waiting for the Lord, both as He comes to us in our celebration of the incarnation at Christmas, and as He will come again in glory and power. As we wait, we prepare our hearts as Christians throughout the millennia have: by turning to God’s Word, prayer, worship and serving those around us. 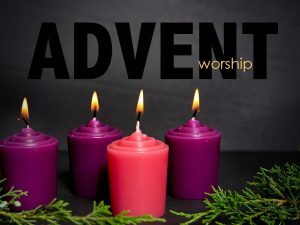 This Advent Season Psalms, appointed for the Sundays in Advent, will shape our Sunday morning worship. During these worship services we will focus on God’s Steadfast Love, His Faithfulness to us, and His Righteousness as we prepare for the coming of Christ our King. During this season, Christmas cards are sent to loved ones, lifting our spirits as we share what is going on in our lives. On Wednesday evenings, at 7:15 p.m. we will close out our Wednesday Evening Discipleship with a special worship service. On these evenings we will be blessed to receive Post Cards from Paul, with words of encouragement for the early Christians and for us today. December 2: God’s Steadfast Love Makes a Way Based on Psalm 25:1-10, we praise the God who remembers us according to His steadfast love. Love arrives in all of its fullness in Jesus. December 9: God’s Faithfulness Makes a Way Based on Psalm 66:1-12, with joy and delight we worship the God whose faithfulness endures forever, and hold fast to the promise that after testing and struggle, God will deliver us. December 16: God’s Righteousness Makes a Way Based on Psalm 85:1-13, we rejoice that even when things don’t look promising, the Lord restores our hope and leads us with righteousness. December 5: You are Not Alone! Paul’s Post Card places us into community where relationships are built so that we can be a blessing to each other. Based on Paul’s first post card to the Christians of Thessalonica (Thess. 3:9-13). December 12: We’re Not Finished Yet! God is always at work in us through the power of the Holy Spirit. We are not yet what we will be tomorrow or a year from now. We live faithfully with the promise that He will finish what He has begun in us. Based on Paul’s post card from prison to the Christians of Philippi (Phil. 1:2-11). December 19: ‘Tis the Season of Giving!’ As we prepare our hearts and minds to receive the greatest gift at Christmas, there are some things we need to give up. Paul invites us to give our burdens and worries to the Lord who gives us grace every step of the way.